Home / Beauty • DIY • Hair / Different Types of Healing Clay & Which is the Best? Different Types of Healing Clay & Which is the Best? 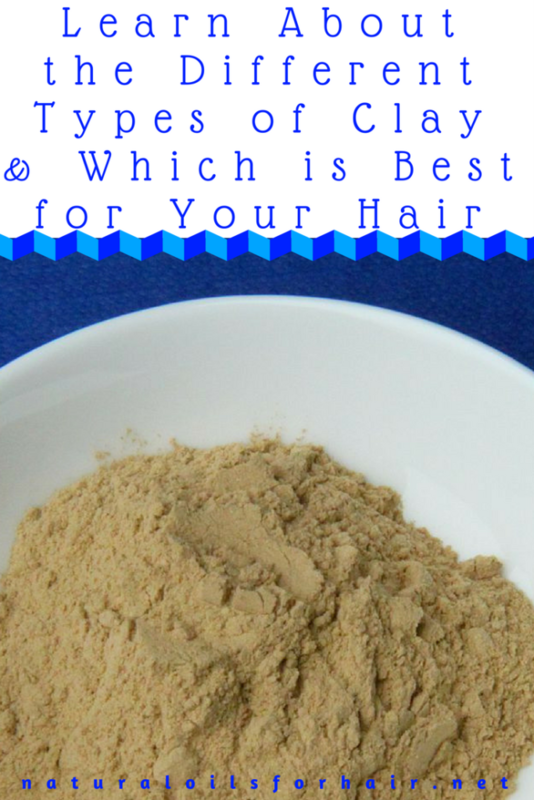 The previous article covered bentonite clay and it’s benefits for hair. However, apart from bentonite/montmorillonite healing clay, there are several other types of healing clay out there and choosing the right one for your hair & beauty purposes can get a bit confusing. Read on for a breakdown of each type of clay, composition, other names they are known by and which one is best for hair and skin. This brand of clay is aka Moroccan clay. It is derived from the Atlas Mountains in Morocco. It is dried then packed for sale. This clay is light/medium brownish in color. It looks like rocks but easily dissolves in hot water. It contains more silica & magnesium than other types of clay. It is sometimes also labeled as ghassoul clay or red clay. Rhassoul clay is suitable for both hair and skin. 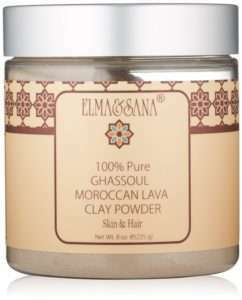 The recommended brands of rhassoul clay include Elma & Sana Ghassoul Clay & Poppy Austin Rhassoul Clay. This clay is a naturally occurring substance found in the mineral kaolinite. It’s soft and usually almost white although the color varies depending on where it’s found. It could be pink-orange, yellow or light orange. It’s the mildest type of clay, appropriate for people with sensitive skin and the most used in cosmetic products. It is aka china clay and white clay. Kaolin clay is best for skin care uses. 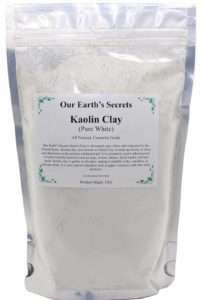 The recommended brands of kaolin clay include Our Earth’s Secrets Kaolin Clay & Mystic Moments Superfine British Clay. Multani mitti or fuller’s earth clay is a naturally occurring clay which is produced in US, Japan, Mexico & UK. The name Multani mitti originates from a place in Pakistan named Multan while mitti means clay. It is believed this clay was first discovered in Multan hence the name. The name fuller’s earth is derived from the clay’s historic use for cleaning wool by textile workers known as fullers. In modern times, it has been used for industrial purposes as an absorbent for oil. In cosmetics, it’s used as a skin whitening agent due to it’s bleaching properties and is considered the best kind of clay for oily skin. 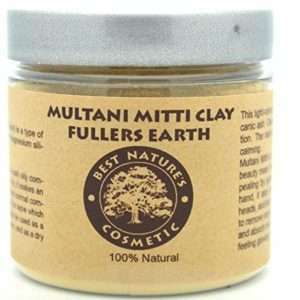 The recommended brands of Multani mitti clay include Best Nature’s Cosmetic Multani Mitti Fullers Earth Clay & Metiista Fuller’s Earth Clay. 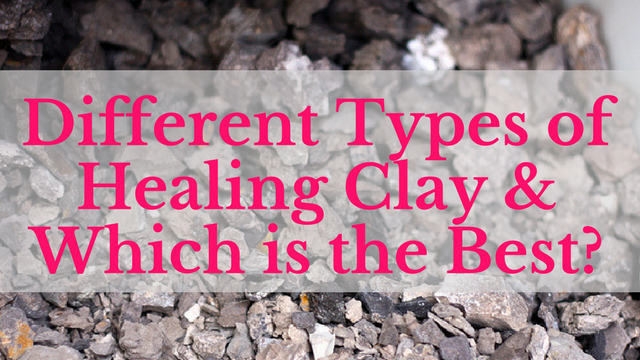 Which Type of Clay is the Best? The best clay for this type of skin is fuller’s earth clay. However, you can mix it with a little bit of kaolin if you have sensitive skin or want to test out a blend to see which one your skin likes. You can use either kaolin clay or fuller’s earth clay for general skin care. If using clay for skin, mix it with distilled water or rose water only. The best clay for hair is bentonite/montmorillonite clay followed by rhassoul clay. You can also mix bentonite and rhassoul clay together. This is what I do and I get excellent results. At the end of the day, everyone’s skin is different so don’t be scared to mix and match the clays. If you do this though, conduct a patch test on a small area before you apply the entire mix to your hair and/or skin. The next article will discuss how to use healing clay for skin, healing clay recipes for the skin, and the best way to consume it. Sign up below to get it in your inbox directly.